Proper weight transfer with a balanced finish can help eliminate pulled shots. Pulling golf shots can hurt a golfer's confidence as well as his scorecard. Most pulled golf shots happen when a swing path goes from outside to in (commonly known as "coming over the top"). This means a golfer is starting his down swing with his upper body instead of his the lower body. This article is for right-handed golfers. Reverse "right" and "left" in the instructions if you are left-handed. Pick a target (anything from a tree to a spot on the grass). Set up to the golf ball and align your body toward the target. Complete your back swing, making sure you shift your weight onto your right foot. Start your down swing by shifting your weight onto your left foot. This will drop the club into an inside position that will keep the ball from being pulled. This is the most important step, so practice it to get it right. 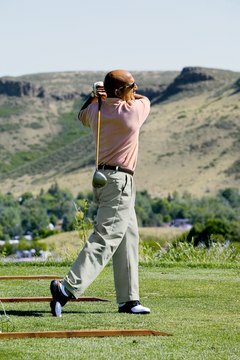 Follow through to a fully balanced position with your belt buckle and chest facing the target and your ball will follow.